Welcome to the Golden Slipper, Boston's Original Bed & Breakfast Afloat! If you are looking for an absolutely unique and romantic B&B experience to celebrate a birthday, anniversary, engagement, or wedding, the Golden Slipper awaits! It is an ideal romantic getaway for two, but also a fun adventure for four. Two private staterooms are offered with plenty of privacy for both couples, and room to relax on the yachts front and aft decks. The Golden Slipper, Boston’s B&B “Afloat” is a traditional Catalina Chris Craft. 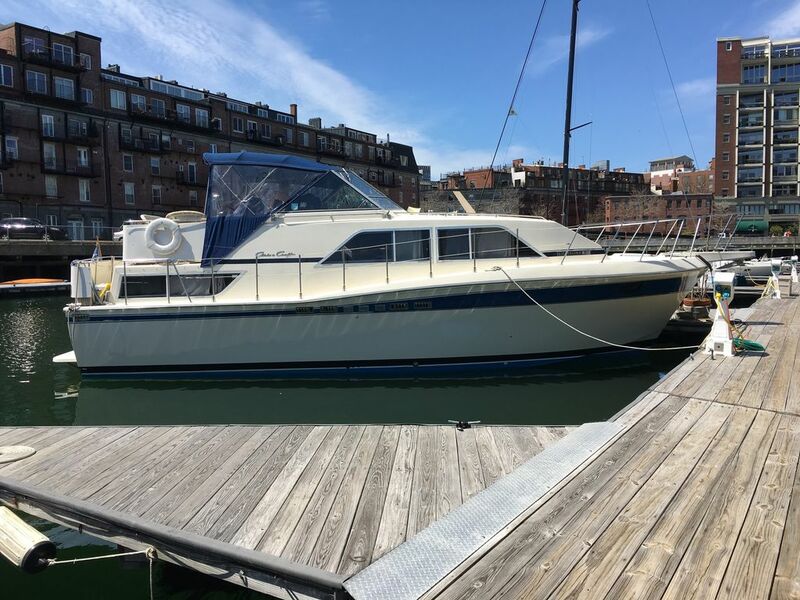 The 40’ Yacht is located at Lewis Wharf, in the heart of historical Boston. The boat stays moored at the slip and you come and go as you please. This is a private party yacht accommodating up to six guests, with a continental breakfast left for you. Cruises of Boston Harbor and dinners are available upon request, during your stay. The Golden Slipper offers the unique experience of having a Bed and Breakfast, with the opportunity to cruise Boston Harbor, for a day or sunset cruise. You return to your slip, the innkeepers leave, and you continue to enjoy your yacht for the rest of your visit. In addition to the two private staterooms, the main salon accommodates 2 more people on a double berth sofa. This layout is perfect for a family vacation, reunion, or “girls' getaway”. The business traveler can enjoy a unique, comfortable setting, as well, and entertain clients with a sunset dinner cruise. Guest comments from all over the world describe the Golden Slipper as a very positive experience, and a unique getaway in a very urban setting. Our guests love our fabulous location, within walking distance to many historic attractions. Escape to the boat for peaceful moments of relaxation on the aft deck, enjoying excellent views of the busy Boston Harbor. In the evening be rocked to sleep with a gentle motion, and wake up to coffee and muffins on the deck, greeting a new day in historical Boston Harbor. A/C unit in the main salon. Fans in the staterooms. *NOT central air conditioning. Two Spacious Private Staterooms Two Forward and Aft Sunning Decks Boston Harbor Tours Available Gourmet Dinners at Dockside or Sunset Cruise Please note: Late check-in fee $40.00 for arrivals after 9:00 p.m. Payment is accepted by check or PayPal, however payments through PayPal will be subject to an additional 4% charge. Gretchen is easy to work with and extremely flexible. Four of us spent the last night of our New England fall foliage sight seeing tour on her yacht before departing for the west coast early the next morning. We had many pieces of luggage which made moving around the cabin almost impossible so beware if traveling with luggage. Bedrooms are tiny but comfortable. The upper deck was fabulous and the weather perfect so we spent the evening there. All in all a fun night, albeit cramped. The best bed and breakfast stay. Loved every minute on this fun boat. Nice 2 bedroom, 2 bathroom stay. So close to the North End where you can enjoy great food and dessert. Will diffently stay here again. The breakfast you left for us was great. Thank you Gretchen for making this possible for me and my Sister. Memorable stay in a fantastic Boston location! Thank you for a fantastic experience! We love Boston, it is such a beautiful city and we have stayed in hotels all over town, but never on a yacht docked next to the fabulous North End. This is a hidden gem! The boat is comfortable, clean, spacious, and it’s location at Lewis Wharf means you’ll have the gentle rocking of the ocean but no boats speeding by. We enjoyed the beautiful views and sunshine on the outside deck, and had the most comfortable nights sleep! Gretchen is a wonderful host, she was so welcoming and gave us a thorough tour. Such a unique stay in Boston - we would stay here again in a heartbeat! Thank you for making my birthday so memorable! It was a neat twist to our vacation staying on the B & B afloat. Gretchen was very helpful in getting things ready and accommodating our arrival. Its a perfect location in Boston Harbor, and the parking was very close and safe. Nice place to stay on the water. Nothing fancy. But nice if you are looking for an on the water experience. We had a wonderful time on the Golden Slipper! Arrived by water taxi, per owner's suggestion, literally right from the airport to the 'front door' of the boat. It was immaculately appointed; we were met at the boat and given a thorough tour, then left to enjoy a perfect evening on board, capped off by the most beautiful of sunrises over the water. We would definitely stay again when back in town. Within Walking Distance of Historical Boston Harbor including Fanueil Hall Marketplace, Freedom Trail, The Aquarium, The Trolley's, Little Italy and Boston Commons.